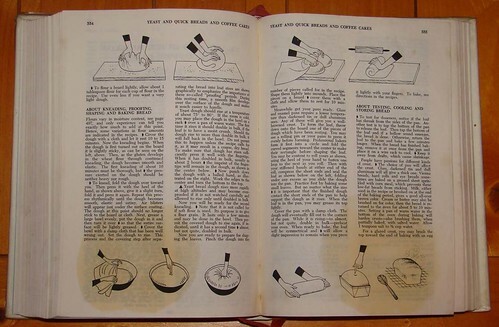 My mother’s 1972 printing of the Joy of Cooking, opened to the page on Yeast Breads. This book literally taught me the basics of cooking. It’s a long story as to why I wasn’t taught by the parental units in my life, but thankfully, I’ve always been able to learn by reading! Not quite sure where the grease stain came from. I’ve been baking bread since my early 20’s. One of my first attempts was a bagel recipe found on the back of the yeast packet. 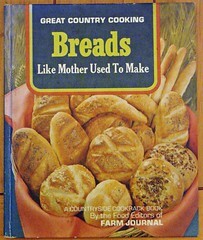 (I had no idea what I was getting into, but reading the bread section of The Joy of Cooking helped. My work mates scarfed them up like they had not been fed for days, but none of us were particularly picky at that age.) 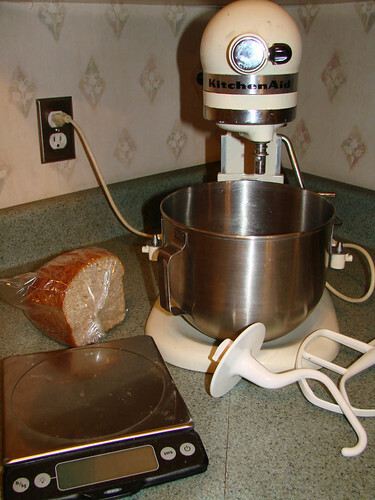 Being a small woman without a lot of upper body strength or height, hand kneading dough was (and still is) difficult for me, and so I only made bread occasionally until the bread machine craze of the late 80’s/early 90’s. After a year of loaves that were over or under risen when baked by my machine, I quit using the bake cycle and just used it to knead the dough. I eventually wore out the seal on the pan, and switched to a standing mixer with dough hook I had inherited from my father. I’ve probably made a loaf of bread a week for almost 20 years, along with rolls, pizza dough, pitas, hamburger buns and cinnamon rolls on occasion. My tastes and nutritional awareness have changed over the years, and I now try to bake with predominately whole wheat flour (for a few years, I didn’t even buy white flour). You can follow your own heart on this one, but know that whole wheat flour is far superior in Iron, Calcium, Vitamin E, and Fiber, along with 13 other nutrients when compared to white flour. If you must use white flour, at least buy it unbleached – the less benzoyl peroxide or clorine gas chemicals used on the plantet the better, seems to me). Now I’m not here to teach you how to get started making bread. There are some great resources out there for that, both online and in print form. Most any good comprehensive cookbook will describe the basics. But I HAVE picked up a few tricks over the years, and developed a basic “go to” recipe for a loaf of bread that is infinitely adaptable. Much of this is an amalgamation of articles from Cooks Illustrated and shows on Alton Brown’s Good Eats. First the recipe, then some comments. Mix water and 5 oz white flour with yeast and stir with paddle attachment on mixer. Add the rest of the ingredients (sprinkle the gluten over the mix rather than dumping it in one place or it will clump up and take longer to incorporate), and stir until just mixed. Remove paddle attachment, cover with a towel, and let stand for 20 minutes. Attach dough hook and knead on medium speed for about 5 minutes. Dough should pull away from the sides of the mixer (or maybe climb up the dough hook) but hold together. Remove dough hook, pat into a ball, cover with damp towel, and let rise until double in size, anywhere from an hour to 1 1/2 hour, depending on your room temperature (why get an additional bowl dirty if you don’t have to). Punch down dough, scrape out of bowl, and knead briefly on a counter top, removing air and forming into a loaf shape. Place loaf into greased bread pan (cooking spray is great here), cover with damp towel, and let rise until doubled, about 45 minutes. When loaf is almost to desired size, preheat oven to 350 degrees. Bake loaf for 45 minutes. Turn out from loaf pan onto wire cooling rack to cool. Why is this recipe by weight rather than by volume? When I recently measured a cup each of whole wheat and white flours using a couple of different methods, my weights varied by more than 1/2 oz. (5 3/8 to 6 oz for whole wheat and 4 3/4 to 5 3/8 for white). Weight will also vary by humidity level. 1/2 oz may not seem like much, but when you consider that most bread recipes have 3 or more cups of flour in them, that difference adds up. Measuring by weight makes for a much more consistent product loaf to loaf. If you want to make this recipe by volume instead, go with 1 cup of white flour and grains + whole wheat flour together to equal 2 cups, but know that you may need to adjust the flour or liquid amounts based on the texture of the dough. Michael Ruhlman’s book Ratio talks about the optimum bread radio being 3 parts liquid to 5 parts flour. This recipe comes close, as 10 oz liquid would equal 16.66 oz flour. Don’t have a standing mixer? No reason why this won’t work the old fashioned way. Start with everything in a large bowl, and turn out onto a counter to knead. Generally, hand kneading calls for a 10 minute knead time. Go for it, and have the toned “big gun” arms to show for it. The wheat gluten helps add lift to the whole wheat flour, making for a lighter loaf. You can find it in natural food stores in bulk, or in most well stocked grocery stores where you find Bob’s Red Mill Products. You could make this recipe with all white flour or all whole wheat flour. The all white will give you a lighter but nutritionally inferior loaf (omit gluten), the all whole wheat will give you a denser loaf. The 20 minute rest after the initial mixing allows the flour to hydrate. This makes for a much better dough and avoids accidentally adding more liquid because the dough initially seems dry. Using milk in place of water makes for a finer crumb and softer loaf. I’m not quite sure why most every bread machine recipe I’ve ever seen called for non-fat dry milk (though this would up the protein content, which perhaps improved browning). No need to scald your milk, unless it is raw. Again, according to Cooks Illustrated, the water you use, if you are using water, does make a difference. Choose unclorinated water or filter your tap water if it is clorinated. Basically, if it doesn’t taste good straight, it won’t taste good in bread either. I love the addition of grains/seeds/nuts for taste and texture. Bob’s Red Mill makes a great 10 grain cereal that is wonderful added to a loaf, and most natural food stores offer a mixed grain cereal in bulk. If you add more than about 1/3 cup of these flavor boosters, you run the risk of the dough not holding together well. But feel free to play with the amounts and see what you like. Want to add larger nuts (like walnuts) and/or dried fruit (raisins, olives, dried cherries etc.)? Add them in the last few minutes of kneading time, and start with 1/4 to 1/3 cup. Fresh or dried herbs and spices can also be a nice addition to this loaf. Heart health wise, using an unsaturated fat like canola or olive oil is much better for you than using butter, but of course, you can’t beat butter for flavor. Yes, it’s not a lot when you consider individual slices, but you may be adding more on toast, so take all your fats into consideration. If using butter, be sure to melt it (is this not the best use for a microwave ever, other than warming up a cold cup of tea?). I prefer “white” whole wheat flour when I can find it for a reasonable price (it was essential when I was cooking at 7,000 feet, giving a much better risen loaf). King Arthur Flour makes one that I believe is nationally distributed – check your local grocery. White Whole Wheat is still 100% whole wheat, with the same nutritional profile, but made from a hard white spring wheat, which has a lighter taste. Great for converting the “I don’t like the taste of whole wheat” people in your family to a more nutritional option. This may seem like more salt than a typical bread recipe calls for, but several Cooks Illustrated tests on whole wheat bread recipes ended in the 2 to 2 1/2 tsp salt range. Because whole wheat flour has a stronger flavor, they felt the extra salt was necessary for balance, and I agree. If you have salt issues, or are making the recipe with more white flour, back off on the amount to 1 tsp. I generally use instant or “rapid rise” yeasts for the faster rise time and more consistent performance. I buy my yeast in 4 oz jars, mark the top with the month/year it is opened, and keep it in the refrigerator. I’ve never not had a loaf rise. If you really have lots of time, add only 1/4 tsp yeast to the liquid/white flour mixture at the beginning and let it sit from one hour to up to 12 hours at room temperature. This sponge, or “biga” in Italian, allows the dough to ferment, adding a complexity of flavor that you just can’t achieve with the “2 hour bread from start to finish” recipes. Once you are ready to continue, add the rest of the yeast (don’t forget it!) and the other ingredients and proceed as usual. You can also place the unrisen loaf, once it is shaped, into the refrigerator overnight and bake it in the morning, supposedly achieving much the same effect. I have not had good luck with this method myself as the outside of the load warms up much faster than the inside, giving inconsistent results in my world. Give it a try if you feel like it and see if it works for you. Have a really cool house and not a lot of time? Try this trick. Heat a mug of water in the microwave to boiling. Set it in the corner of the microwave and place dough in microwave to rise. It’s warm (because the space is small) and it’s humid, just what the yeasty beasties love. But it will irritate your loved ones who want to use the microwave in the next hour or so. “Let rise until double in size”. Every bread recipe says it. But generally your bread is in a round bowl, small at the bottom and wide at the top. How the heck to you know what double looks like? We detail oriented sciencey types hate this lack of precision. So…if you can find a large straight sided plastic storage container, grease the inside (I love cooking spray for this purpose), place loaf inside, and place a large rubber band around the container at dough height. When it is double in size, you’ll be able to easily tell. And the lid (cracked to allow gasses to leave) will keep your loaf moist. Brilliant. Looking for a more crispy crust? Commercial bakers have steam jets in their ovens to help achieve this much desired characteristic. An almost-as-good short cut is to throw a few ice cubes on the bottom of your oven when you put the loaf in (avoid placing them right next to a heating element). All bread recipes call for a liquid, gluten flour (generally wheat), some sort of leavening and salt. Many also include a sweetener and an oil. Ever look at old farmstead cookbook recipes for bread and they look really good but make enough to feed all the extended family and the hired help (making 2 to 3 loaves at a time)? Just use their recipe as a guideline for ingredients, use the proportions from my recipe above, and you are home free. I picked this 1971 book up at a used book store in San Jose California many many years ago. It is one of my favorites for simple bread ideas. My bread baking essentials: a standing mixer and a scale. The bread is what’s left of a loaf of oatmeal, great toasted! MY bread baking essentials: a standing mixer and a scale. The bread is what’s left of an oatmeal loaf, great for toasting. Want to know more about how to make great free form loaves of “artisan” bread? Check out this site from Farmgirl Fare here. It’s great information, and I just love this blog in general. So, there you have it. Now turn off the computer and get baking! Miles Away Farm Blog © 2010, where we’re miles away from baking up all the possible combinations of this loaf of bread, but well on our way to making an attempt. Great tips! I’m a spelt lover. It makes lovely, soft bread and has the thumbs-up nutritional profile too. Have you had luck adding cracked wheat or whole amaranth to breads? I have had really mixed results with the two, do you have any secrets in that department? Hi Joni. I have added amaranth and cracked wheat to breads – again, using a total of about 1/4 to 1/3 cup (so more for texture than anything). I find the vital wheat gluten is critical. I my mind (and this is very unscientific) I picture the sharp edges of things like cracked wheat cutting the natural gluten strands, keeping the bread from rising the way I want it to. The extra gluten helps counteract that. You might need to soak the cracked wheat in boiling water first, just to soften it up a bit. Then drain and add.